ornament of acanthus leaves and flowers. 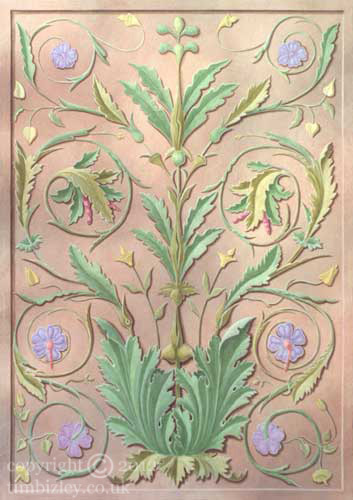 The decorative elements of this mural panel have been given a suggestion of standing out from the background in dimensional relief, but the technique works well with just the trompe l'oeil effect worked on the decorative elements alone. The style of this example slightly pre-dates the wide use of the method enjoyed during the 18th and 19th centauries to decorate boiserie, wall panels, doors, and furniture. Painted murals are highly bespoke and the muralist is skilled at creating a harmony between the proportions and elements of a room and the painted work.